In the 39 years since Bernice Gera sued to become the first female umpire in professional baseball, women have commanded the space shuttle, run for president of the United States, held cabinet positions such as secretary of state, been elected speaker of the U.S. House of Representatives and become chief executive officers of major corporations. Two women have even officiated in the National Basketball Association. But today, nine years after Gera's death, women are no closer to umpiring a Major League Baseball game than they were in 1972, when Gera worked one game in the Class A New York-Penn League. Lately, they may even have lost ground. 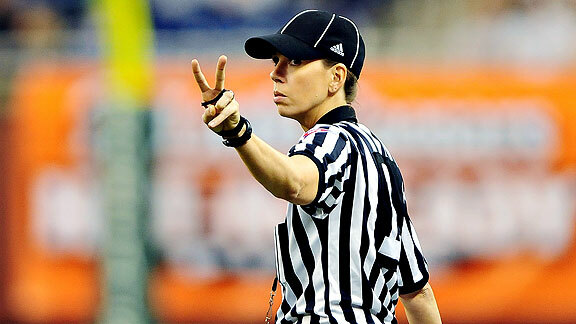 Since Ria Cortesio's controversial firing from the Double-A Southern League after the 2007 season, there hasn't been a single woman umpire in affiliated baseball -- that is, in minor leagues whose teams are MLB club affiliates. And Cortesio was only the sixth woman umpire in the minors, spread out over 35 years. Except for three brief crossover periods, only one woman worked at any time. "The numbers have stagnated," said Perry Barber, an umpire for 31 years and one of the longest-serving women still active. "They've gone from one to zero. That's pathetic. There's just no reason for it. There is a reason for it, but nobody is talking about it." Baseball's glass ceiling has held so tightly that it appears many women have given up trying. 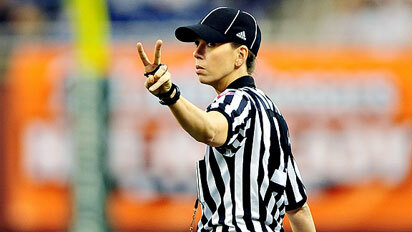 The number of women attending the two major umpiring schools, never large, has slowed to a trickle. One school reported it had no women applicants the past two years. That doesn't surprise Kate Sargeant, a 30-year-old Washingtonian who recently abandoned her dream of umpiring in the majors. Sargeant was the last woman to advance from umpiring school into the final selection camp for entry-level professional umpires, in 2007. She was not hired. Even after two years in independent ball and another turn through umpiring school, Sargeant couldn't get a job in affiliated ball. "When you don't see someone like you on the field, and you don't think it's possible for you to be on the field, it's harder," Sargeant said. "The NBA made a decision they wanted to be proactive about this. The officials they found [Violet Palmer and Dee Kantner, hired in 1997] are highly, highly qualified. "And the decision was made by management. As far as I know, baseball hasn't made that decision. Maybe one day, they will." In the meantime, Sargeant created a website, www.womenumpiringbaseball.org, for fellow women in blue. Communication and support, she said, are important if women are ever to break through the door of the baseball fraternity. "It can't continue forever," Sargeant said. "It can't." If all the women who have umpired in affiliated ball were still alive, they would fit comfortably in one large automobile. Only one came close enough to the big leagues to draw media attention: Pam Postema. Her career spanned from 1977 to 1989, during which she spent seven seasons in Triple-A and worked MLB spring training games in 1988 and '89. Many women believe Postema could have been MLB's first permanent female umpire had commissioner A. Bartlett Giamatti, long considered her champion, not died of a heart attack on Sept. 1, 1989. Postema was fired that fall and later sued baseball for discrimination; the suit was settled out of court. None of the other women -- Gera (1972), Christine Wren (1975-77), Theresa Cox Fairlady (1989-91), Shanna Kook (2003-04) and Cortesio (1999-2007) -- rose above Double-A. Two more landed in independent leagues. Barber called games in the Atlantic League from 1998 to 2001, and made history in 2008 as part of an all-female crew at an unofficial spring training game between the New York Mets and the University of Michigan. She is the only female umpire in the Cape Cod League, the leading summer showcase for top college players. Sargeant worked professionally in the New York State League and American Association in 2007, and in the United League in Texas in 2008. Sargeant's father, a Little League umpire, introduced her to baseball at age 5 by taking her to her first Dodgers game. She loved it all, from the sight of gleaming Dodger Stadium at the top of Chavez Ravine to the cadence of the peanut vendors' calls. Sargeant volunteered at 15 as an umpire for a school project. She enjoyed it, and found a calling. She knew she could never play major league baseball; umpiring provided an avenue to the field. Prospective umps with major league ambitions must attend one of two schools operated by retired MLB umpires. The Harry Wendelstedt school, in Daytona Beach, Fla., accepts about 100 students for a five-week course from early January through early February. At the same time, the Jim Evans school holds sessions in Kissimmee, Fla., and Tucson, Ariz. Both schools charge $2,950 for tuition, housing and meals. Some attend the schools simply to improve their skills. Barber, for instance, attended the Wendelstedt school five times. Others hope to catch the eye of the Professional Baseball Umpires Corporation, which hires and evaluates minor league umpires. Each year the top 10 percent to 20 percent from each school attend the PBUC's Evaluation Course, from which the best prospects are hired for entry-level positions in rookie or short-season Class A leagues. Sargeant advanced from Wendelstedt to the Evaluation Course in 2007. However, she said she finished near the bottom of the class. "I was told I was No. 37 out of 40, and they hired 36," she said. "For the record, I think that's the spot I deserved, because there were a couple of situations I didn't handle as well as I would now." No woman has made the Evaluation Course since, in part because few are attending the schools. Brent Rice, a Wendelstedt instructor, said none applied the past two years. "You compare that to the early 2000s, when we had five or six each year," he said. Evans said two women attended his school this year. One quit after a week because of illness, he said, and another returned to her native Taiwan when it finished. The lack of women applicants concerns Evans, who says he supports women in athletics. His daughter Lindsay was an elite ice dancer, and he hired Cortesio as an instructor after the Southern League fired her. He believes women have the skills and toughness necessary to umpire. He wishes more would try. "I'm disenchanted and disgusted that more women don't apply," Evans said. "I don't know if it's because they have families or careers or what, but not many make the commitment to a professional school." Both schools say they welcome female applicants. So does the PBUC, which will be opening its own school this January in Vero Beach, Fla. But none of them recruits prospective umpires, male or female, which Barber believes is a mistake. "They don't feel they have to put out any effort to find students," Barber said. "I know they don't recruit guys, either. But if they don't want to do it, designate somebody to do it." Barber said she would target college softball players and other young women in competitive sports. Failing that, Barber believes women should apply to the schools en masse, 20 or so at a time, making it harder for instructors to single them out. The ever-greater number of women playing youth or high school baseball should alleviate one concern Barber has heard: that women who never played baseball can't know the game as well as men. "I still really believe they think women are incompetent," Barber said. "We're tolerated because admitting it would be illegal, but we're not regarded as capable or competent on some level. We have to go through the same B.S. over and over and over, and it just doesn't seem to be getting any better. It's a stagnant pool where nothing is growing or changing." Slights and hostility toward female umpires by their male counterparts are nothing new. Cortesio's dismissal, detailed by Bruce Weber in his book about umpires, "As They See 'Em," remains a sore point among women like Barber, who finds the circumstances curious. In 2006, Cortesio's career appeared to be on the rise. She worked the All-Star Futures Game -- a prestigious assignment for a minor league ump -- and was graded out as the fifth-best umpire in Double-A by the PBUC. The top four moved up to Triple-A, putting Cortesio in line for the next vacancy. Like players, umpires must advance through the minors or risk being released. Generally, umps are expected to move up after two years in Class A and four in Double-A. Though 2007 marked Cortesio's fifth season in Double-A, that spring she received another choice assignment, working the bases in a spring training game between the Chicago Cubs and Arizona Diamondbacks in Mesa, Ariz. -- the first woman since Postema to do so. But things changed quickly. By midseason, her rating had dropped to No. 17. At the end of the year, Cortesio was let go. Barber believes if Cortesio had reached Triple-A, MLB would have felt pressure to promote her or use her as a vacation fill-in for a permanent umpire. Barber has had her own interesting run-ins. In the Atlantic League, she said a male plate umpire once loudly overruled her from 100 feet away on a dead-ball rule she applied correctly. The league backed her and quietly fined the other ump $50, she said. Sargeant still umpires occasional youth tournaments and hopes to pick up more college assignments next year. While still trying to break into affiliated ball, Sargeant promised herself that if her dream fell apart, she would hike the Appalachian Trail. This year, she set out on the hike. "I was angry about a lot of stuff the first third of the trail, including baseball," she said. Along the way she met another hiker, who said he played in the minors. They discussed her abortive pro career and the institutional roadblocks she faced. He offered an opinion that did nothing to alleviate her anger. "He said, 'Sorry, Kate, it's a fraternity, and it's going to be hard for women to be accepted in that fraternity,'" Sargeant said. He wasn't telling Sargeant anything she didn't already know. Pat Borzi's three-decade career in journalism has taken him from Long Island to South Florida to New England to New Jersey and on to Minneapolis. He covered the declining years of Larry Bird and the Boston Celtics for the Portland (Maine) Press Herald, and the rise of the latest Yankee dynasty for the Newark (N.J.) Star Ledger.